Kuwait has granted Egypt an aid package of KWD 300,000 (around $985,500) for the removal of landmines from Egypt's north coast area, Al-Ahram daily reported on Monday. The aid falls within the investment strategy for the North Coast Development Project, running from Alexandria to the border with Libya. Egypt has been stepping up efforts to clear the north coast of millions of WWII landmines with the aim of developing the area economically. Plans for the area include expanded mineral extraction and tourism development projects. The north coast of Egypt and Libya is littered with landmines laid during World War II by Germany, Britain and their respective allies. Each year, landmines and other unexploded ordnance cause death and injury to civilians in the area. Egypt’s Defence and National Security Council approved the Kuwaiti aid, which is being granted through the Arab Fund, according to Al-Ahram. The money will be used for the project’s second phase. According to Major General Mahrous El-Kilany, head of the mines committee at the Ministry of International Cooperation, Egypt has already cleared landmines from 1,450 square kilometers of land during the project’s first phase. 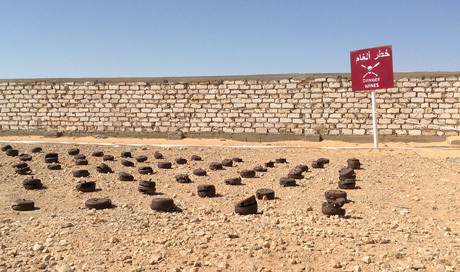 More than 20 percent of the world’s landmines are in Egypt, according to official figures.